#BadiBAATA, #BadiBata,Prof. 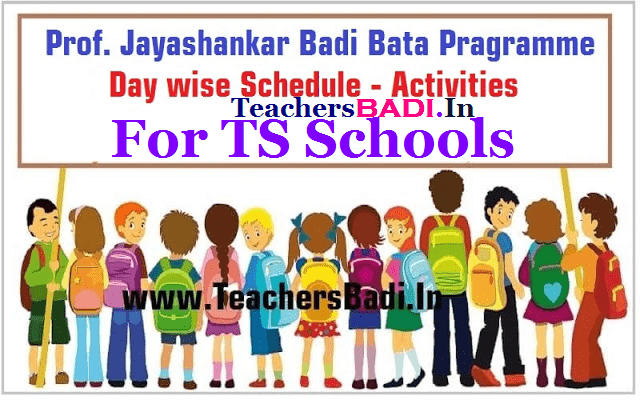 Jayashankar Badi Bata Pragramme-Day wise Activities for TS Schools: Badi Bata Pragramme is Special Enrollment drive/ts schools admissions programme. 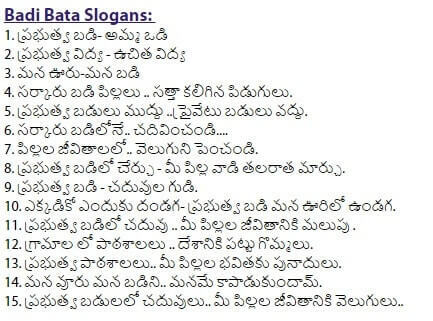 Badi Baata #Slogans. The Badibata campaign to improve the enrollment In way of meeting the parents and community members in the school catchment area by the Head Master, teachers and SMC Members. TSSA has given instructions on Celebration of Prof. Jayashankar Badi Bata-day wise programme and it has communicated to all DEOs and RJDs in the reference of (1) Guidelines and Day wise programme communicated by the State Project Director and (2) Instructions given by Hon’ble Deputy CM and Minster for education Government of Telangana. ➛ Enrolment of all school age children into Schools. ➛ Admission of Out of School Children into Regular Schools (Short term dropouts), RSTCs/NRSTCs - “Special Training Centers” (long term dropouts & never enrolled children) and KGBVs. ➛ Mainstreaming of children from STCs / Bhavita Centers into the Regular Schools / KGBVs. ➛ Discussion on School Quality and School Improvement Programmes with parents and SMC. ➛ Ensuring water, sanitation and hygiene in all schools. ➛ Planning for starting of STCs and other centers for the education of children of migratory families. Every HM shall prepare pamphlets on the highlights of School performances and plans to improve with a request to parents to join their children in Government School. Update the Village Education Register (VER) with name wise and no. of children in the age group of 5 to 15 with enrolled and out of school children. Preparation of School Profile with regard to achievements, results and facilities. Preparation of list of Out of School Children i.e., Never Enrolled, Dropout, Child Labour, etc. in the school catchment area. Preparing the list of enrolled children in the catchment area i.e., separately for Govt. / Local body schools, Private recognized schools, Residential schools, Model schools and KGBVs. Completion of Registers and Records, Cumulative Records and finalization of results for the year 2016-17. Preparing the list of class wise children who are unable to read, write and perform four basic fundamental air thematic operations based on the baseline test conducted on 3Rs during March 2017. Preparing Annual Plans and Lesson Plans for the first Unit of 2017-18 by all teachers. Video Conference on 01.04.2017 with the District Collectors, DEOs, MEOs, etc. ( Up to Mandal level) and discussion on preparedness for the conduct of Badi Bata and discussion on day wise programme. The MEOs shall prepare the list of all OSC girls, drop out girls, girls who are in danger of dropping out etc. based on the reports from the school HM shall be forwarded to the KGBV in the mandal for admission. The KGBV Special Officer and other KGBV staff shall set up an information and admission desk at the KGBV in order to give on-the-spot counseling and admission to OSC girl children. The Special Officer shall organize the KGBV Open Day for prospective children and their parents to visit the KGBV to get an understanding of the facilities available. On this day, the KGBV shall be cleaned and decorated, the work of the students such as art, craft etc. shall be prominently displayed and all staff shall be in attendance. HM and Teachers are responsible for finalization of lists of total school age children in the habitation and catchment area. House campaigns by the HM and Teachers on the enrollment of children as per the list. Preparation of list of outgoing children i.e. class V in case of Primary Schools and class VII/ VIII in case of Upper Primary Schools. Preparing the Transfer Certificates (TCs) for outgoing children. with TCs along with him to the nearby Upper Primary/High Schools and enroll. The Upper Primary School Headmasters are responsible and shall take the students of class VII/VIII with TCs along with him to the nearby High Schools and enroll. Habitation Meeting / Gram Sabha / Ward Sabha should be organized before start of schedule and Ward member / Councilor / Corporator should be informed and requesting to participate in the Gram Sabha. 1. The regular School timings should not be disturbed due to Badi Bata and only HM should accompany the Public Representatives and Officials . 2. Conducting Habitation/GP meetings on RTE Act, to create awareness on the provisions of the Act. 4. Constitution of Task Force Committee. 5. The HMs of the respective schools are to be made responsible for admitting the children of 5th, 7th and 8th class into nearest UP/High Schools without collecting entry/admission fees into any class in Govt/Aided schools. 7. School Complex Head Masters are responsible to monitor on conduct of day wise activities of Badi Bata in their catchment area. 8. A cell is to be opened at all the District Project Offices of SSA for monitoring the implementation of the programme. 9. Mapping of vulnerable pockets/Special Focused Groups areas with respect to dropouts, low enrolment, habitations of under privileged communities etc., may be identified in districts well-in-advance to address the issues in a focused manner. 10. Various village level organizations shall be motivated to participate in the programme. 11. Book depots shall be opened in identified schools in convergence with the Department of Libraries. “Reading Mela” shall also be organized in all schools to demonstrate the performance of children and also to inculcate reading habit among children. 12. Steps shall be taken to declare some of the villages as “Out of School Children Free” as part of Special Enrolment Drive and continue throughout the year till the completion of all villages. 13. All the Schools should observe “Green Day” and plant the trees in the School Premises. 15. All the HMs of the schools should constitute a team with the students and teachers to take care of the plants and should see to protect and watering them. 17. The DEO & Ex-Officio PO, Telangana SSA should effectively coordinate the activities proposed with all the Stakeholder departments/organizations like Teacher Unions & Civil Society Organizations under the leadership of the District Collector and ensure that the programme is made a grand success in the district. 18. The HMs of all the schools should ensure the class promotion of the students from the present class to the next higher class and open separate registers by enrolling them. 19. A Task Force Committee may be constituted with Tahsildar (MRO), MPDO, MEO, CRP’s, ICDS supervisor, NGO representative, Asst. Labour Commissioner. The committee shall visit the habitations and monitor the implementation of Badi Bata and help the HM and SMC in relieving child labour from employer. Spell II: from 01.06.2017 to 00.06.2017. As per instructions of the Hon’ble Deputy CM and Minster for education Government of Telangana has instructed to conduct Prof. Jayashankar Badi Bata programme as per schedule for improvement of enrollment in Government Schools at least 5 % to previous year in each school involving all the district, Mandal, Village officers, SMCs and NGOs. The State Project Director TSSA, Telangana, Hyderabad has communicated detailed day wise programme with detailed activities to be taken up during this programme. 9. 11/04/2017 F.N. · Preparing the list of child labourworking with employers. · Preparation of School wise infrastructure gaps i.e., Classrooms, Toilets, Drinking water etc. A.N. · Meeting the employers by the HM and SMC to relieve the children from work and join them in school, Special Training Center, KGBVs. SwachhPatashala – Attending the clean and green work of schools, i.e., painting black board, toilet cleaning, drinking water, dusting the furniture, removing the waste, etc. Preparing the final list of children not yet enrolled, item wise, i.e., Never Enrolled, Dropout, Who are eligible for KGBVs, Bhavita Centers, Special Training Centers, etc. pertaining to their catchment area and furnish the lists to the concerned MEO, Principal KGBV, Coordinators of BhavithaCenters, STCs. Take the opinions of the students on Mid-day meal and toilets, drinking water, etc. and develop a plan of ac tion to attend the children grievances and opinions. Conduct of cultural programme with children (BalaSabha). In view of the instructions of Hon’ble Deputy CM and Minster for education Government of Telangana and State Project Director TSSA, Telangana, Hyderabad, the following activities to be under taken. In this regard, District Collector has instructed to all the Deputy Educational Officers / Mandal Educational Officers/ Sectoral Officer of TSSA/ School Complex Head Masters/ Head Masters/DLMTs / CRPs/MIS Coordinators and Data Entry Operators to ensure that as per timeline given the programme should be completed successfully without any deviation.